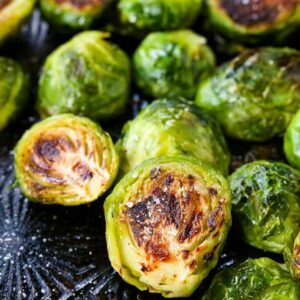 These Crock Pot Crispy Brussels Sprouts are SO crispy and delicious, you’ll never believe these sprouts came out of a crock pot! 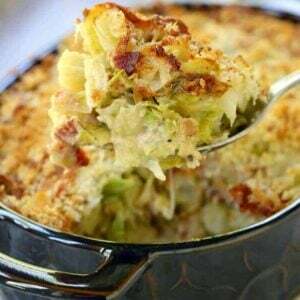 If you love brussels sprouts recipes as much as we do, you have to try our cheesy Brussels Sprouts Casserole! 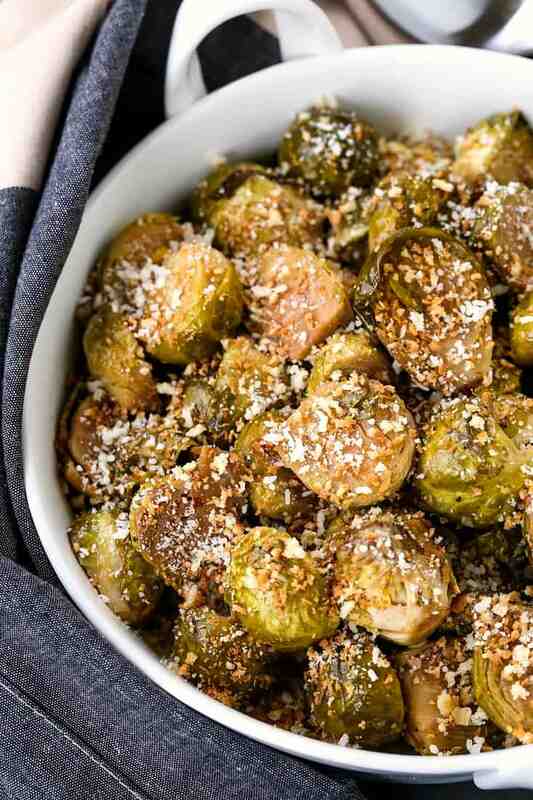 We also love simple Roasted Brussels Sprouts for an easy side dish recipe! So I’ve called this brussels sprouts recipe “crispy” because i want you to know that these aren’t going to be any mushy sprouts recipe. These brussels sprouts only cook for 4 hours in your slow cooker, on low, so they come out perfectly tender – and not mushy in any way. What the crock pot does is infuse all the flavors of the liquid that we’re going to add to these brussels sprouts. 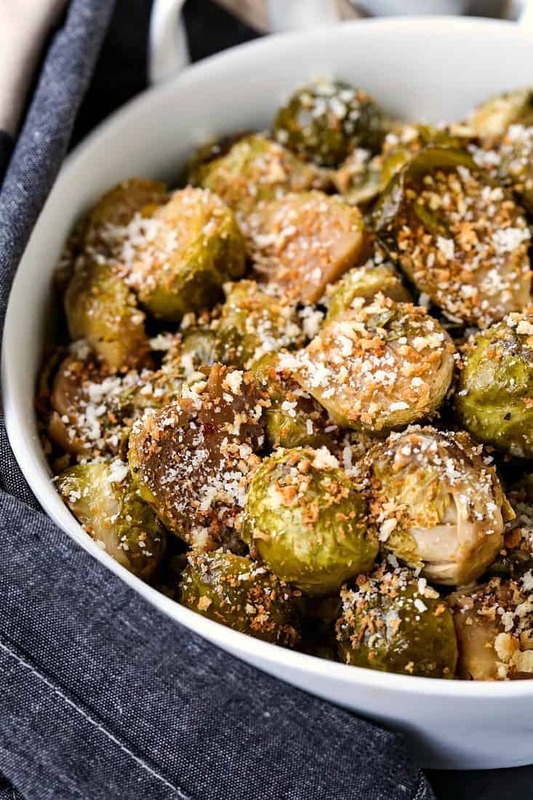 Wine, balsamic vinegar, garlic and seasonings so these sprouts are so full of flavor you won’t be able to stop eating them. And then, right at the end we’re going to add a splash of cream to the cooking liquid and top these sprouts with panko bread crumbs and parmesan cheese. I promise you, these are going to be some of the best sprouts you’ll ever have! 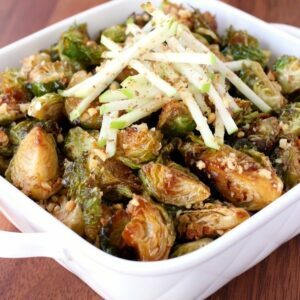 What Can You Serve With This Brussels Sprout Recipe? Chicken, turkey, beef, pork – fish too! One of our favorite dinners to make is our Roast Turkey Breast, a side of our favorite sausage stuffing and these sprouts. But like I said, these brussels sprouts are going to go really well with most dinner recipes. Try a juicy grilled steak or a comforting Brown Gravy Meatloaf or even some of these Bang Bang Fish Nuggets! 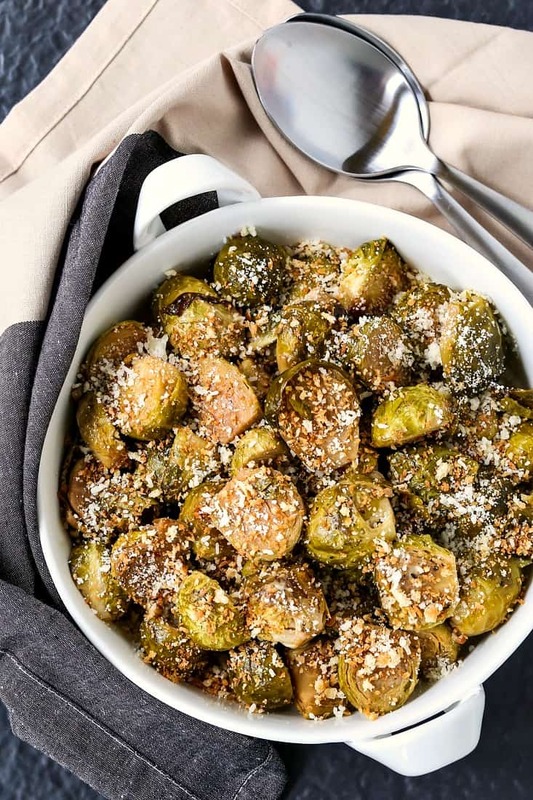 Also these sprouts are going to go perfectly with all your holiday dinners! Having them cooking in your slow cooker instead of taking up oven space is a huge bonus. Plus the fact that they take about 5 minutes to get together and then they cook all on their own. Looking for a more low carb recipe? Well, first I have to tell you the breadcrumbs don’t add many carbs to this recipe. But if you really are cracking down just leave the breadcrumbs out and use only the parmesan cheese…or crushed pork rinds??? Just saying, they would add quite a nice crunch to these brussels sprouts! 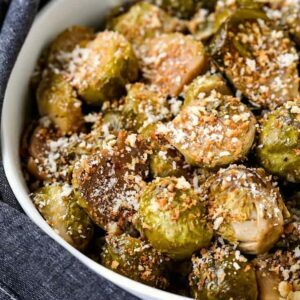 This crock pot brussels sprouts recipe is not only perfect for your holiday dinners but for any dinner that you need an easy side dish recipe! 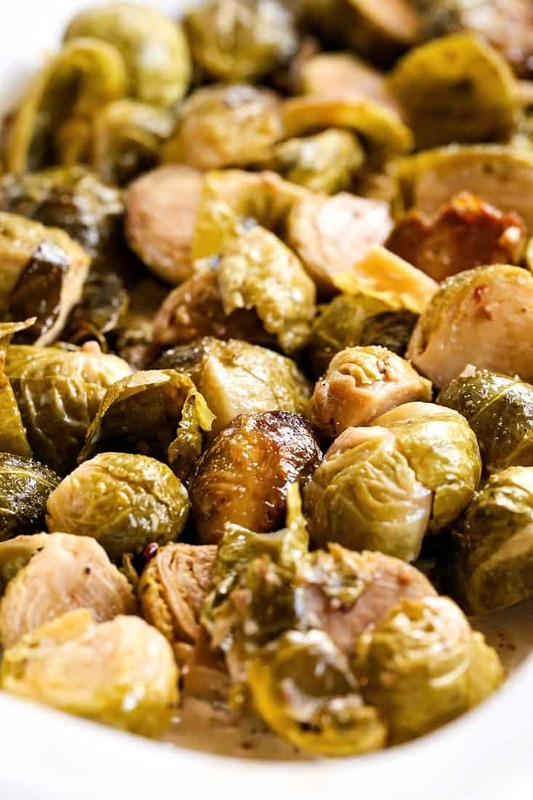 Add the brussels sprouts to a 4 quart crock pot or slow cooker. Pour in the wine, olive oil and balsamic vinegar into a bowl. Add the salt, both peppers and garlic and whisk to combine. Pour over the brussels sprouts and toss to coat. Set your crock pot to low heat for 4 hours or high heat for 2 hours, low setting is recommended. When the brussels sprouts are done, pour in the cream and stir. Remove the srputs to a serving dish and top with the breadcrumbs and parmesan cheese. To toast the breadcrumbs, add them to a dry skillet over medium heat. Cook, tossing often untl the breadcrumbs are light brown in color.